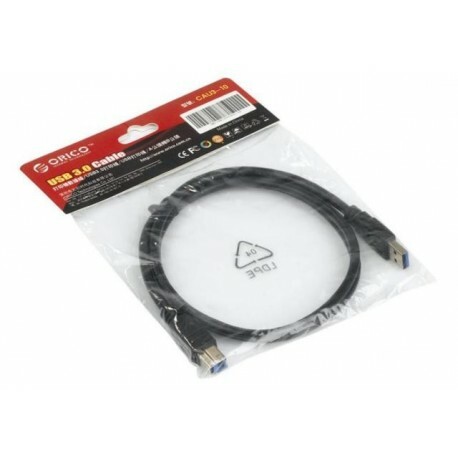 ORICO newly released a series of USB2.0/USB3.0 data cable, all data cable conductor used in high-quality oxygen-free copper core, The all-metal braid shield with anti-jamming bead , perfectly shield all kinds of interference outside, Ensure truly USB2.0 transfer speed. By buying this product you can collect up to 1 loyalty point. Your cart will total 1 loyalty point that can be converted into a voucher of Rp‎ 1.000. ORICO newly released a series of USB2.0/USB3.0 data cable, all data cable conductor used in high-quality oxygen-free copper core, The all-metal braid shield with anti-jamming bead , perfectly shield all kinds of interference outside, Ensure truly USB2.0 transfer speed. Internal tinned copper shield network+ Double foil shielding , Anti-jamming bead, Pure copper wire core, line body soft and smooth, high-grade durable ! The transfer speed is stable, has strong anti-jamming capability! l Quality oxygen-free pure copper cores, high-speed transmission. l Double layer of aluminum foil+ double shielded and double anti-jamming, Transmission stability, Strong anti-jamming capability. l Data cable twisted-pair (impedance matching): Minimize signal crossing and Harassed of the data line.